In Syria, the war to overthrow the secular government in Damascus has attracted Islamic militants from around the world, but they have relied on funding and support from Saudi Arabia, Qatar and perhaps most importantly Turkey, where an election reflected growing popular resistance to this war policy, writes Rick Sterling. Even though Erdogan’s Justice and Development Party (AKP) won the most votes, they lost their majority in parliament and must now find a coalition partner, as Turkey’s new parliament was seated for the first time on June 23. Now begins the political bargaining and negotiations to form a governing coalition. Depending on the outcome, Turkey may stop or seriously restrict the flow of weapons and foreign fighters through its territory into Syria. If Turkey does this, it would offer a real prospect for movement toward negotiations and away from war in Syria. Why? The Syrian war continues because Saudi Arabia, Qatar, Kuwait, the U.S., France, the UK and others are spending billions of dollars annually to fund the armed opposition and sustain the war in violation of the UN Charter and international law. Closely allied with Qatar and the Muslim Brotherhood, Turkey has been the primary path for weapons and foreign fighters in Syria. ISIS has depended on export of oil and import of weapons and fighters through Turkey. Al Qaeda’s Jabhat al Nusra, Ahrar al Sham and other armed opposition groups have depended on weapons and foreign fighters coming in via Turkey for attacks on northern Syria including Syria’s largest city, Aleppo. –Turkey hosts the Political and Military Headquarters of the armed opposition. Most of the political leaders are former Syrians who have not lived there for decades. –Turkey’s intelligence agency MIT has provided its own trucks for shipping huge quantities of weapons and ammunition to Syrian armed opposition groups. According to court testimony, they made at least 2,000 trips to Syria. –Turkey is suspected of supplying the chemical weapons used in Ghouta in August 2013 as reported by Seymour Hersh here. In May 2013, Nusra fighters were arrested in possession of sarin but quickly and quietly released by Turkish authorities. –Turkey’s foreign minister, top spy chief and senior military official were secretly recorded plotting an incident to justify Turkish military strikes against Syria. A sensational recording of the meeting was publicized, exposing the plot in advance and likely preventing it from proceeding. –Turkey has provided direct aid and support to attacking insurgents. When insurgents attacked Kassab Syria on the border in spring 2014, Turkey provided backup military support and ambulances for injured fighters. Turkey shot down a Syrian jet fighter that was attacking the invading insurgents. The plane landed 7 kilometers inside Syrian territory, suggesting that Turkish claims it was in Turkish air space are likely untrue. –Turkey has recently increased its coordination with Saudi Arabia and Qatar. This has led to the recent assaults by thousands of foreign fighters on Idlib and Jisr al Shugour in northern Syria. Armed with advanced weaponry including TOW missiles, and using suicide bomb vehicles, the armed groups overran Syrian armed forces defending both cities. The assaults were facilitated by Turkey jamming and disrupting Syrian radio communications. –Turkey has facilitated travel into northern Syria by extremist mercenaries from all parts of the globe including Chechen Russians, Uyghur Chinese, Europeans, North Africans, South Asians including Indonesians and Malaysians. The assault on Jisr al Shugour was spearheaded by Chinese Uyghur fighters and suicide bombers crossing over from Turkey with tanks and heavy artillery. –Turkey itself has provided steady supply of recruits to the Islamic State. Like other countries which have had citizens indoctrinated with Wahhabi fanaticism, they have done little or nothing to limit the indoctrination or restrict emigration for ‘jihad’. –Finally, Turkey has permitted the supply of huge quantities of car bomb ingredients (ammonium nitrate fertilizer) to the Islamic State. On May 4, the New York Times reported these shipments at the Turkish border. Sixteen days later ISIS overran Ramadi in an assault that began with 30 car bombs with ten reportedly the size of the Oklahoma City bombing. –Turkish authorities have charged four regional prosecutors with attempting to topple the government. Their “crime” was to insist on the inspection of four trucks headed from Turkey to Syria. The trucks contained weapons and ammunition in violation of Turkish law. The trial of the four prosecutors is ongoing, 18 months after the inspection. –Turkish authorities arrrested seven high ranking military officers over the inspection of trucks taking weapons and fighters to Syria. –Turkish authorities banned social media and news outlets from reporting on arms shipments through Turkey to Syria. Twitter and Facebook accounts that talked about the shipments where shut down. Erdogan went on to threaten to “eradicate” Twitter. –Turkish President Erdogan threatened two life-term sentences for the editor of Hurriyet daily newspaper for publicizing support of the armed opposition in Syria by Turkey’s intelligence agency MIT. –A whistle-blowing MIT (intelligence agency) officer who opposed the agency’s collusion with terrorism in Syria was arrested, convicted and imprisoned. After two years he managed to escape and tell his story. The blockbuster account was broadcast on Turkey’s OdaTV and later translated into English and published here. Was an American Journalist Murdered? As seen in the examples above, Turkish AKP authorities have aggressively tried to suppress information on the involvement in Syria. If they have been that aggressive with Turkish journalists, prosecutors and military officers, how far might they go against a foreign journalist working for Iran’s Press TV? The American-born journalist Serena Shim died just days after she documented the use of World Food Program trucks to transport foreign fighters to the border with Syria and into ISIS territory. After learning that Turkish intelligence was looking for her, Serena Shim was so concerned that she expressed her fear on television. Two days later, Serena Shim’s car was hit head-on by a cement truck. The driver of the cement truck disappeared but was later found. There are many discrepancies about what happened. The first reports indicated the truck and driver left without stopping. Then the driver and truck were located, and then photos appeared showing a collision. While some Turkish security services have preemptively exonerated the driver of the cement truck, the local prosecutor has filed charges against the driver, accusing him of causing death through negligence. There are many suspicious aspects, not least is the fact that the cement truck’s wheels are angled toward the car, not away as one would expect with a vehicle trying to avoid collision. The death of American journalist Serena Shim, and her factual investigative reporting on Syria and Turkey, stands in sharp contrast with the sensational media accounts about the “kidnapping” of NBC reporter Richard Engel. That event turned out to be a hoax contrived by “rebels” to manipulate American political opinion. With the complicity of individual reporters and mainstream media, the fraud was successful. The bias in mainstream western media is further demonstrated by the almost complete media silence about the death of Serena Shim and her important journalistic work. For the past 13 years, Erdogan’s Justice and Development Party (AKP) has had majority control of Turkey’s parliament. In the recent election, AKP’s share of the popular voted plummeted 10 percent and they lost their parliamentary majority. The results are a clear rebuff to Erdogan and AKP policies. Sixty percent of voters went against AKP, splitting the vote among the three alternative parties. The pro-Kurdish and Leftist People’s Democratic Party (HDP) burst onto the scene capturing 13 percent of the votes and equaling the number of parliamentary seats captured by the rightist and anti-Kurdish National Movement Party (MHP). The main opposition party is the social democratic Republican Peoples Party (CHP) with 26 percent of the vote. Over the coming weeks, AKP will try to form a coalition government with one or more of the alternate parties. However it won’t be easy. The natural bedfellow would be the anti-Kurdish and rightist MHP but they are demanding the resumption of a corruption trial against AKP leaders including Erdogan’s son Bilal. That trial would probably lead back to President Erdogan himself so it seems unlikely AKP will ally with MHP. The three alternative parties could form a coalition to govern without AKP, but it’s hard to imagine the staunchly anti-Kurdish MHP allying with the pro-Kurdish HDP. If a majority coalition cannot be formed within 45 days, the Turkish constitution requires a rerun of the election. Even with severe repression and intimidation, the Turkish public is aware of Turkey’s policy supporting war on Syria. One consequence of the war has been almost 2 million immigrant refugees with the dispersal of many throughout Turkey, providing cheap labor and adding significantly to the unemployment problem. In addition, there have been terrorist attacks in the border region and an escalation of corruption and repression as external money and weapons have flooded the area en route to Syria. The war against Syria has been widely unpopular and played a significant role in the election. –All the opposition parties called for change in Turkey’s foreign policy. –The head of the main opposition party (CHP) says Turkey will start controlling the border and stop the flood of arms and fighters into Syria. The coming weeks will indicate how Turkey moves forward: Will AKP manage to form a coalition government with one of the opposition parties? Or will there be another election? Will Turkey start enforcing the border and stop shipments of arms to the armed opposition as demanded by the leader of the main opposition party? This would be a huge change in the dynamics within Syria. Without a rear base of constant and steady support, the armed opposition would be forced to rely on its own resources rather than those of foreign governments. 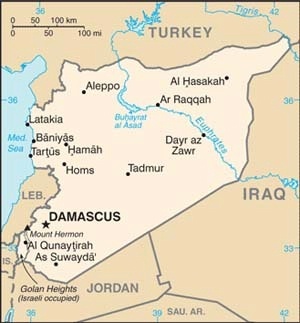 This armed opposition would quickly wither since they have very little support base within Syria. Since the election, there are already signs of a shift in the balance. Kurdish forces recently captured ISIS’ important border crossing at Tal Abyad. This has been the main route of weapons, fighters and supplies between Turkey and the Islamic State’s ‘capital’ at Raqqa in eastern Syria. Thirteen months ago, it looked like the war in Syria was starting to move toward resolution. The last remaining armed opposition in the “capital of the revolution” Homs reached reconciliation and withdrew from the Old City of Homs in May 2014. On June 3, 2014, the election in Syria confirmed substantial support for the government. Since then, we have seen dramatic changes. On June 10, 2014, ISIS surged through western Iraq and captured the city of Mosul and huge quantities of American armaments including tanks, rockets, humvees, etc. That led to the creation of the “Islamic State” and expansion in eastern Syria including Tabqa Air Base where hundreds of Syrian soldiers and ISIS fighters died. This past spring saw the coalescing of numerous foreign and Islamist groups into the Jaish al Fatah (Army of Conquest) supported by Turkey, Saudi Arabia and Qatar. With high-powered TOW anti-tank missiles and thousands of shock troops they were able to overtake both Idlib and Jisr al Shugour near the Turkish border. ISIS and the Army of Conquest are both dependent on the Turkish supply line. If that is closed off or seriously restricted, it will dramatically change the situation. With the prospect of losing the base of support in Turkey, will the opposition try something desperate to draw the U.S. and NATO into the conflict directly? The Turkish people have indicated they want to stop their government’s war on Syria. If their will is respected, it should lead to restricting and stopping the foreign funding and promotion of the conflict. If Turkey stops the flood of weapons and foreign fighters into northern Syria, it will be following instead of violating international law. This will give peace a chance in Syria. Assad should capture Jihadis and do a brain scan. Will likey find they are psychopaths. As they are incurable. if they are psychopaths, they need to be eliminated! A brain scan to determine what percentage of one’s nature and actions are “psychopathic” should be the order of the day for everyone involved in implementing Mid-East policies — especially the Israelis and their enabling body and military proxy the US government. Not only would this reveal who among the policy makers is psychopathic; in conjunction with a lie detector and select questions it could (in some cases) reveal how well informed or uninformed, and out of touch with reality, these decision makers are. And a few more questions to those in the know. WIth the UN, ICC and various other international â€˜watchdogsâ€™, with the plethora of information of US involvement in terrorism through its Al Qaeda proxy terrorist forces, how does this happen? How is it allowed to happen? What is the point of these international entities? Israel is an ally of the United States. Is Israel not incensed with the United States for bringing Al Qaeda terrorist forces to its very doorstep? Seems odd, this love/hate relationship. Syria is an ally of Russia. Is Russia not incensed with Turkey? If yes, how did Turkey and Russia manage the huge gas pipeline deal from earlier this year? Seems odd, a love/hate relationship. Is politics and economics 2 totally separate things? Please strike my email address…..thanks ! Questions to those in the know. WIth the UN, ICC and various other international ‘watchdogs’, with the plethora of information of Turkish involvement, how does this happen? How is it allowed to happen? What is the point of these international entities? Rick, please keep up the good work, please keep us informed. Very sobering article. Thank you. The entire Middle Eastern “regime Change” regimen the West (US) has engaged in, is all originally due to Israel’s PNAC plan ”New Strategy for Securing the Realm” in conjunction with the “Yinon Plan” to keep the Muslim’s fighting among themselves while drawing attention away from Israel and their continuing war crimes to date. Oddly enough Israel and the Saudi’s had the common enemy of Assad, and Turkey has joined their alliance — while the US pretends ISIS is the enemy, our “allies” Israel, Saudi Arabia and Turkey do all they can to help ISIS — great for weapons sales and profiting from death and destruction. It seems that up to the chemical attack in Ghuta, it was very much NATO war. But then strange things started to happen. Obama’s Red Line was crossed, everything was ready for Libya II, and then British Tory backbenchers rebelled, so did Labour backbenchers and UK support was nixed. Similar coalition apparently emerged in USA. While extreme right was deeply suspicious of the jihadists on xenophobic grounds, and left an “fashionable anti-imperialist”, such person cannot make parliamentary majorities in UK and USA yet. I heard that the word was that the attack was manufactured by Turkish intelligence. On top of that, some jihadist came back to West Europe and wrecked mayhem here and there. While such cases were sporadic, they got huge publicity. Then ISIS emerged as a big player. To some degree, this is classic headline manipulation because the log of the developing story features the words of a Kurdish officer in Kobane but no other eyewitnesses of that “crossing”. However, AP in the reports on the fall/liberation Tel Abyad wrote that ISIS lost a major supply route. We know that when needed, AP, Reuters and major new outlets like Daily Telegraph are ready to support the Administration and the Government of her Majesty, so both seem un-enthusiatic. NATO member Turkey’s role in supplying ISIS forces is well documented. Despite the press hysteria about the Turkish President’s corruption, it’s clear ErdoÄŸan does not act on his own initiative in supporting ISIS terrorists. However, Turkey, Saudi Arabia and Qatar have acted at the behest of the United States to topple the Syrian government. Turkish, Saudi and Qatari support for violent terrorist forces must be understood in the context of US geo-strategic efforts in the Middle East. Intentionally or not, Sterling and others have obfuscated on this critical point. The Syrian Mussalaha (â€œReconciliationâ€) movement, formed in December, 2011, began taking its message to the West, largely through the efforts of Mother Agnes-Mariam of the Cross, Mother Superior of the Monastery of St. James the Mutilated near Qara, Syria. Sterling is a co-founder of the Syria Solidarity Movement, a nonprofit organization that sponsored Mother Agnes’ North American speaking tour and, more generally, provides alternate Syrian views of the crisis. Mother Agnes attempted to prove that Syrian opposition activists fabricated the videos showing victims of the deadly Ghouta chemical attack in Damascus on 21 August 2013. “Our first concern was the fate of the children we see in the footages. Those angels are always alone in the hands of adult males that seem to be elements of armed gangs. The children that trespassed remain without their families and unidentified all the way until they are wrapped in the white shrouds of the burial. Moreover our study highlights without any doubt that their little bodies were manipulated and disposed with theatrical arrangements to figure in the screening. Peter Bouckaert of Human Rights Watch, has said that Mother Agnes’ claims were entirely false, and that HRW had found no evidence that the videos were staged. However, the HRW report was largely based on analysis supplied by the fake “citizen journalist” Eliot Higgins (then blogging under the pseudonym “Brown Moses”). Higgins’ analysis, which located the putative launchers inside government territory, was later discredited. You are a well versed lier. As a person close to many people who died in Gouta chemical attacks by the Syrian Regime, it does not suppose me that sectarian voices like yours and The murderous Regime in Damascus cronies are willing to forego any ration and any morals to defend the dirty war waged by Assad and his sectarian forces against Syrian people. Your defense of the mass genoside of Assad speaks a lot. Israel (with US support), Saudi Arabia, Quatar. Sorry! Juhadis far more damaging and they rot countries. Jihadis are enemies of Sunnis even more than Shias. They are like a cancer. for sharing light on these complex issues. You can tell things are not exactly what they are said to be by media main stream when BBC extensions like Aljazeera call this SYRIA’S WAR – TO PULL WOOL OVER OUR EYES!! The US/NATO war on Syria has morphed into Turkey’s war on Syria. Yes, this article is every bit as “excellent” as the one by Fuller. another question that probably needs to be asked is: “will usa/nato lean on turkish politicians and STOP them from shutting down the pipeline?” that is, will they stop supplying ISIS but continue supplying Nusra et al? all seem like real possibilities. You guys need to read the Judicial Watch info. Declassified DIA document released by Judicial Watch. Most insurgents are Jihadi, next sentence Opposition support by US and coalition-Opposition being the Jihadis!. Mark Curtis in Secret Affairs: Britainâ€™s Collusion with Radical Islam complains about “London and Washington turning a blind eye” to Saudi “bankrolling Islamist and jihadist causes”. All these sources assiduously avoid a direct indictment of the ongoing covert and overt US/NATO war on Iraq, Syria and Libya — and the specific US use of Al Qaeda brand terrorist forces (including Al Nusra and ISIS) to destabilize and destroy these nations. The US/NATO war on Syria began in 2011 with Al Qaeda affiliated terrorist attacks and has never ceased. Armed conflict in Syria began in Daraa in March 2011 with terrorist acts of arson directed at government buildings and sniper fire from rooftops, shooting at both police and demonstrators. In fact, in these initial terrorist attacks, more policemen than demonstrators were killed. Yes, there is great civil unrest in Syria. But the war on Syria has never been a civil war. This does not mean that all of the armed forces opposing the Syrian government since 2011 have been Al Qaeda terrorist affiliates. But there is absolutely no question that the most militarily relevant, ruthlessly aggressive and destructive forces have been Al Qaeda terrorist affiliates. The US/NATO war on Syria consistently has been a war of terror on the Syrian people using various brands of Al Qaeda (Al Nusra and Islamic State forces) to attack Syria through Turkey, as well as through Iraq and Jordan. Calling it “Turkeyâ€™s War on Syria” is troubling indeed.